Otolaryngology Update: 2nd National Conference on the Indian Society of Thyroid Surgeons,November 17-18, 2017 at Christian Medical College, Vellore. 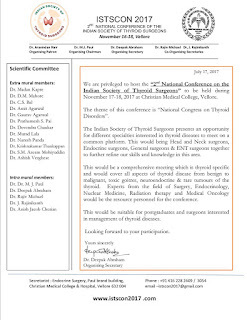 2nd National Conference on the Indian Society of Thyroid Surgeons,November 17-18, 2017 at Christian Medical College, Vellore. We are privileged to host the “2nd National Conference on the Indian Society of Thyroid Surgeons” to be held during November 17-18, 2017 at Christian Medical College, Vellore. 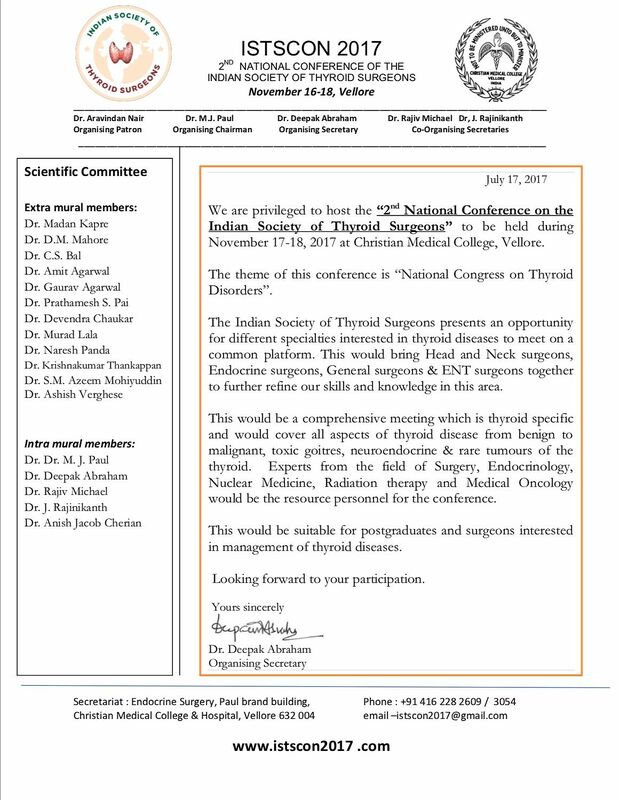 The Indian Society of Thyroid surgeons presents an opportunity for different specialties interested in thyroid diseases to meet together. This would bring Head and Neck surgeons, Endocrine surgeons, General surgeons & ENT surgeons together to further refine our skills and knowledge in this area. This would be a comprehensive meeting which is thyroid specific and would cover all aspects of thyroid disease from benign to malignant, toxic goitres, neuroendocrine & rare tumours of the thyroid. Experts from the field of Surgery, Endocrinology, Nuclear Medicine, Radiation therapy and Medical Oncology would be the resource personnel for the conference. This would be suitable for postgraduates and surgeons interested in management of thyroid diseases.Looking forward to your participation.